Elvis is alive and living in Singapore. 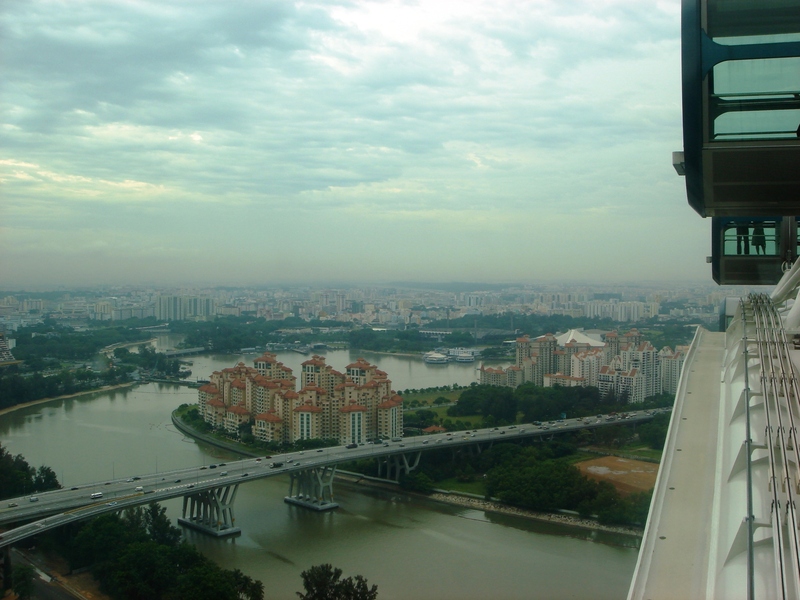 Taken from the Singapore Flyer on a rainy day. I sat at the bus stop, sweating as usual. Six months in Singapore had done nothing to help my body get used to the humidity; could just as well have lived in a sauna. This had some advantages though, like not having to wear makeup since it just slid off your face anyway. Imagine my surprise when Elvis joined me at the bus stop. All dressed up in a shiny (nylon in that heat?) brown shirt with sparkly silver stars, and a slightly darker brown pair of pants. Brown platform shoes helped him reach to my shoulder. Who knew Elvis was that short? A beautiful pompadour was set in concrete and a pair of mirrored sunglasses rounded off the look. I wanted to clap and cheer when he took a stance, hip thrust forward, yanked out a black plastic comb from somewhere and smoothed one wayward strand of hair back into place. Why didn’t I have my camera with me?! The bus dutifully arrived, exactly on time. I kid you not, I’ve timed them. We boarded the bus and stepped from 40 degrees C to -10. Elvis walked in front of me and I could have sworn I heard a ‘howdy’ when he greeted the driver. I had made a hobby of watching the locals’ faces when they saw me coming. Their expressions would range from: Oh sh.., don’t let the ang moh (long nose/foreign devil) sit next to me! Or Sh.., she’s coming my way. Look away, look away! This time, that reaction was reserved for Elvis. In a country where conformity is king, eccentricity is not encouraged. Elvis merely sneered his trademark sneer and sat down in splendid isolation. I could have asked for his autograph, I was that impressed. You are currently browsing the archives for the Singapore category. The joys of having Writer’s Block. All in the name of mint.